A Sergeant Major of the Drums or Drum Major is the leader of a marching band, drum and bugle corps, or pipe band. The Drum Major is usually positioned at the head of the Band or Corps and is the figure who stands out in the public eye. The Drum Major is responsible for providing commands either verbally, through hand gestures, or with a mace in the military or with whistle commands or a baton in the US civilian bands to the ensemble regarding where to march, what to play, and what time to keep. The position of Drum Major originated in the British Army with the Corps of Drums in 1650. Military groups performed mostly duty calls and battle signals during that period, and a fife and drum corps, directed by the Drum Major, would use short pieces to communicate to field units. 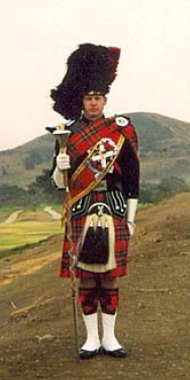 With the arrival of military concert bands and pipe bands around the 18th century, the position of the Drum Major was adapted to those ensembles. A Drum Major in the armed forces is these days an appointment and not a rank. The mace has long been associated as a symbol of authority. The drum major uses the mace to convey signals to the pipes and drums. 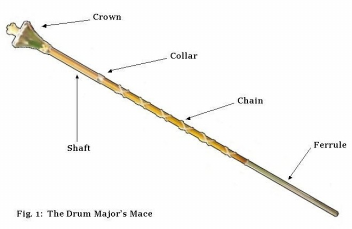 Mace commands vary from regiment to regiment and historically have been handed down from drum major to drum major. Generally, starts, stops, and counter march commands are similar amongst the regiments since these commands are those commonly used with massed bands and tattoos. The mace derives from the medieval weapon of the same name. It was composed of a spiked head attached by a chain to a wooden handle. The mace was swung around the head to clear a path or to strike an unhorsed opponent. The basic parts remain, although adapted. The body or shaft of the mace may consist of Malacca cane, wood, or fiberglass. The shaft may be wrapped in either chain, cord, or be left plain. The proper length of the mace is shoulder height from ferrule to finial. There are a number of competitions for Drum Majors including Field Inspection, “L” and “I” Pattern, and Field Conducting. Field Inspection is a judging of the Drum Major’s dress and deportment. Field Conducting includes parade, festivals, field shows, and conducting with or without a band. Competitors must execute some kind of Beating of Time following each com­mand. Time limit is four (4) minutes. Timing begins on the first count after the execution whistle or vocal for Step Off and ends after the dismissal of the band.